towers were undermined, they simply slid into the pit, and remained resolutely whole, hence the very picturesque ruins which remain. 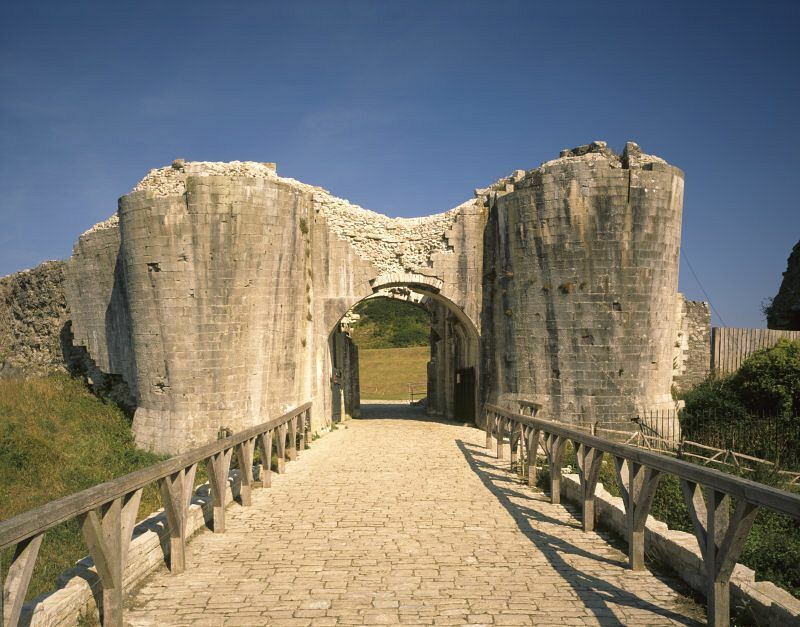 Probably more damage was done by the locals than by the troops as they looted the site for its limestone masonry. It was used to rebuild the pretty local village which had also suffered at the hands of the destructive parliamentarian troops. Corfe Castle's ruins remain atop a steep chalk hill, guarding the only natural route through the Purbeck Hills. 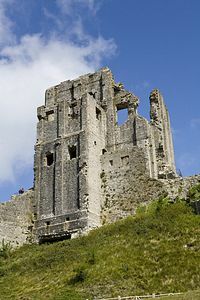 Corfe Castle was begun by William the Conqueror in the late 11th century and it was completed during the reign of Henry I, who found it came in very handy for imprisoning his elder brother Robert, Duke of Normandy, in 1106. The castle was used as a seat of government as well as a strategic stronghold and had huge sums invested in it over the centuries with a "gloriette" tower house, a great hall, chapel and chambers for the queen which overlooked the gardens. stronghold, fortress and royal residence. 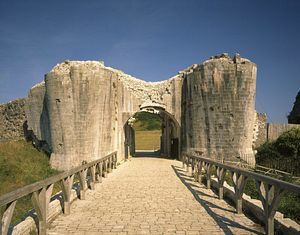 With breathtaking views and waymarked walks around the Dorset countryside, it is a playground for children of all ages. There is still sufficient structure, albeit ivy clad and invaded by greenery, to see the original arrow loops and murder holes where boiling water and arrows were used against potential invaders. 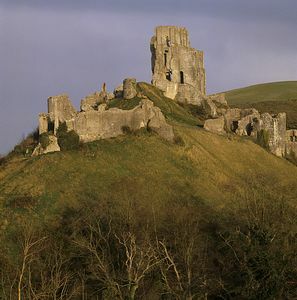 You may see the resident ravens which have recently returned to nest at Corfe Castle. It was believed that if the ravens left the castle it would fall, and according to local legend in 1638 the ravens disappeared and the castle was largely destroyed in 1646. Bird watchers may also see the peregrine falcons, buzzards and black redstarts which are often spotted around the area of the castle. 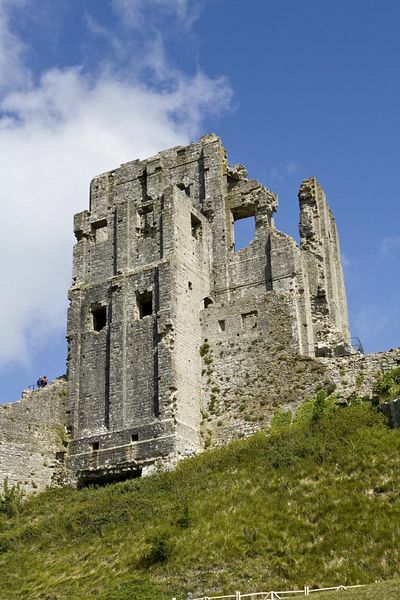 Corfe Castle's history continues to be celebrated by the National Trust with court jester days, castle quest activities and living history events. There is a delightful licensed tea-room where clotted cream teas may be enjoyed in the garden, or browse for gifts in the National Trust shop in the pretty village square below the castle.